1880 The League of American Wheelmen quickly became a powerful national special-interest group once it was formed in 1880 to ". . . promote the general interests of bicycling, to ascertain, defend and protect the rights of wheelmen, and to encourage and facilitate touring." The group, commonly referred to as The LAW, also sanctioned bicycle races and lobbied for road improvements. Bicyclists, known then as "wheelmen," were challenged by rutted roads of gravel and dirt and faced antagonism from horsemen, wagon drivers, pedestrians and local governments. More than 100,000 cyclists from across the United States joined the League. Today it continues "Working for a Bicycle-Friendly America" as the League of American Bicyclists. The Bicycle Museum of America in New Bremen, Ohio traces bicycle development and displays many of the machines once privately held by the Schwinn family. The Pedaling History Bicycle Museum maintains an extensive collection for public view near Buffalo, New York. Curator David Herlihy has organized a remarkable traveling exhibit for the Lockwood Mathews Mansion Museum. The Bicycle Takes Off: From Boneshaker to Boom, currently is touring East Coast museums. The International Bicycle Fund offers a concise timeline for bicycle development and provides access to the National Bicycle History Archive of America. Visit the Canberra Bicycle Museum and Resource Centre for an Australian perspective, or travel to Japan to view the work of the Japanese Bicycle History Research Club in English or Japanese. Rideable Bicycle Replicas began turning out spoked behemoths in 1973, using materials and techniques largely unchanged from the late nineteenth century for collectors, museums and circuses. The company specializes in the high-wheel "Ordinary," sometimes called by its British name, the "Penny Farthing" -- after the smallest and largest coins in circulation. The Classic & Antique Bicycle Exchange offers advice on restoration and acquisition, and the Wheelmen restore and ride antique bicycles. 1880 Employees of the Salem Post Office at the Women's Christian Temperance Union Building. In 1880 the Post Office was located at Commercial Street and the corner of Ferry Street. 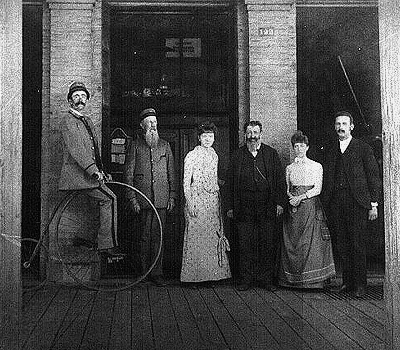 From left: Ben Taylor on a "penny farthing" or "ordinary" as it was sometimes called, George Hatch, Sadie Palmer, Rich Dearborn, Ella Dearborn and Captain L. Scott. High-wheeled bicycles were sized to fit their riders by changing the diameter of the front wheel from 40 to 60 inches. The bigger the wheel, the faster the fixed pedals could drive the heavy machines. Ordinary riders contributed the slang "header" to the language because the big bicycles regularly pitched novice riders forward, over the handlebars. 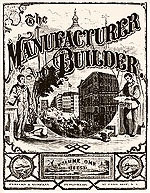 The Manufacturer and Builder combined stories that today would be found in Time, Popular Mechanics, Harpers, National Geographic and Forbes among others. 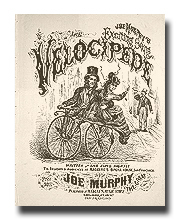 This is the cover of Volume 1, Issue 1, published in January 1869. The Library of Congress, Cornell University Library and other institutions have collaborated to provide a unique online resource in The Nineteenth Century in Print: The Making of America in Books and Periodicals, a collection that presents digitized editions of twenty-three popular periodicals. Search for yourself, or begin with 19th Century Bicycle News. 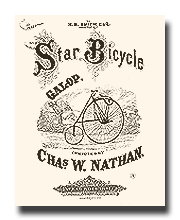 Star Bicycle Galop by Charles W. Nathan was published in New York by Spear & Dehnhoff in 1882. The galop was a lively social dance allegedly of German origin that became popular in England and France before coming to America. The man put his right hand around his partner's waist and with his left hand held her right; the couple danced the galop's simple step side by side -- slide, close, slide -- around the ballroom to music in 2/4 time. The galop's spirited rhythm was written into the finale of many ballets, where the step was elaborated for theatrical effect. 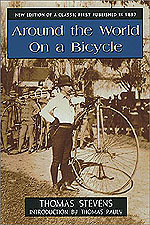 On April 22, 1884, Thomas Stevens left San Francisco pedaling a Columbia Standard model high-wheeler with the outrageous goal of becoming the first man to ride a bicycle across the United States. He reached Boston on August 4th and decided to continue around the world. He soon sailed to London for the ride across Europe, the Middle East and Asia. The 50-inch high-wheeler was heavy and cumbersome; his supplies were limited to socks, a spare shirt and a slicker that doubled as tent and bedroll. Much of the country he traversed was wild. Yet he persevered, recording his colorful and often harrowing adventures during the three-year odyssey in a classic of 19th century adventure and travel writing first published by Charles Scribner's Sons in 1887.